It's easy to write dialogue. It's not so easy to write good dialogue—and bad dialogue can sink a scene and disengage a reader pretty quickly. Good dialogue needs to be immediate. It needs to be resonant. It needs to sing on the page. 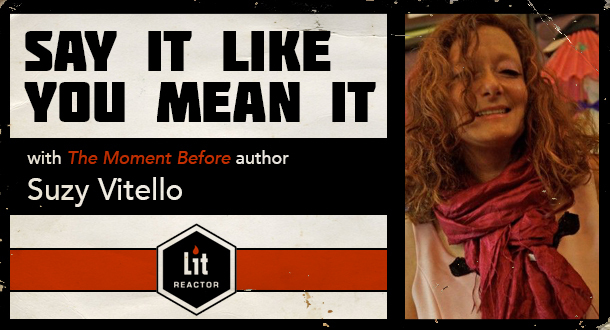 Suzy Vitello, the den mother of Chuck Palahniuk's Portland-based writing workshop, and author of The Moment Before and The Empress Chronicles, is a pro at writing and editing dialogue that grabs a reader. In this ten-day intensive, she'll demystify the art and craft of writing effective dialogue. Through five craft lectures and Q&A discussion threads, participants will gain new tools and have access to a forum to solve their dialogue-related conundrums. The first five days of the course will consist of five in-depth lectures developed by Suzy on how to write stronger dialogue. And as an added bonus, the final lecture will include exclusive dialogue-writing tips from Chuck Palahniuk, Lidia Yuknavitch, Chelsea Cain and Monica Drake! The ten-day class will feature an on-going Q & A thread where participants can take part in discussion forums where they will be free to ask Suzy about the lectures or other dialogue-related questions. Once the five-day lecture portion of the class is complete, students will be asked to submit a prompt-driven writing assignment of a specified page count in order to test out their new skills. Participants will have the option of posting their homework for input from classmates. From the assignments, five submissions will be selected at random to be critiqued by Suzy and shared with the class for more in-depth study on how to apply the lessons. And as an added, final bonus: Three more students will be selected at random at the end of class to have their work critiqued by Suzy—anything they want, up to ten pages. She'll then deliver detailed, line-by-line critiques to those students post-class. Is narrative necessary to avoid talking heads? And if so, how much is enough when it comes to dressing up the chatter? Have you ever been tempted down this road? “Oh, James, ever since my very unsuccessful real estate transaction with my ex-husband of six years, I’ve been reluctant to buy a house.” Learn what the alternatives are, and also why in back-and-forth passages between characters you should resist resolution and completion. How to avoid the dead zone rhythm of “he said” “she said.” With examples from some of your favorite authors. It’s not always about what is said. This lecture will consider placement, authenticity, narrative pace and other aspects of authority-building. A distillation of the art and craft of fantastic dialogue. "Suzy's course was an eye-opener. From the big-picture ideas like exploiting show-don't-tell to the details of what makes good blocking, this class left me feeling much more comfortable and confident on the page." —Ben M.
"As a beginning writer taking my fist class I couldn't have landed in a better place. Suzy's lectures were filled with vital information delivered in a way that even a newbie could grasp. Experienced writers clearly learned a lot too. The camaraderie amongst students created an atmosphere that encouraged risk taking and experimentation." —Rachel J. "Suzy Vitello has this uncanny ability to distill a story down to its purest elements. A writer receiving feedback from Suzy will know precisely what to do with their story in order to make it work the minute she hands it back to them." —Andrea T.
"Seductive Beginnings is an insightful and inspiring class. I shared work with a skilled set of writers and received feedback that helped me solve structural issues in the piece I submitted. Suzy Vitello has an editorial eye that sees into the heart of a story. And beyond that, she’s an all-around, great teacher and reader." —Eli F.